Anadyr was our meeting point. Some of us had already spent a few days in town, whilst most of us arrived the same day either via Nome or via Moscow. Once on board we made ourselves comfortable and familiar. The ship was along side the pier so no first movements could disturb our observation of the numerous Beluga Whales and Largha Seals that fished in the swell around the ship and along the coastline. Before dinner we met in the lecture theatre for a first general meeting with the expedition team. After we enjoyed a calm dinner before the ship rolled into Anadyr Bay, departing at about 21:30. Many of us enjoyed the late first breakfast on board. Afterwards Oksana introduced us to the various protected areas of Russia and the young National park of Beringia. Beringia was a land bridge between Lena River and Mackenzie River during the last ice age (10,000 years ago). Both the Beringia National Park and Wrangel Island Reserve were situated on that bridge. Now both represent an essential part of the cultural and natural heritage of the area. This morning we organized gumboots which we would have to wear at all outings. Afterwards Helen briefed us about the Zodiacs and the procedures around them. After lunch we went on our first landing. 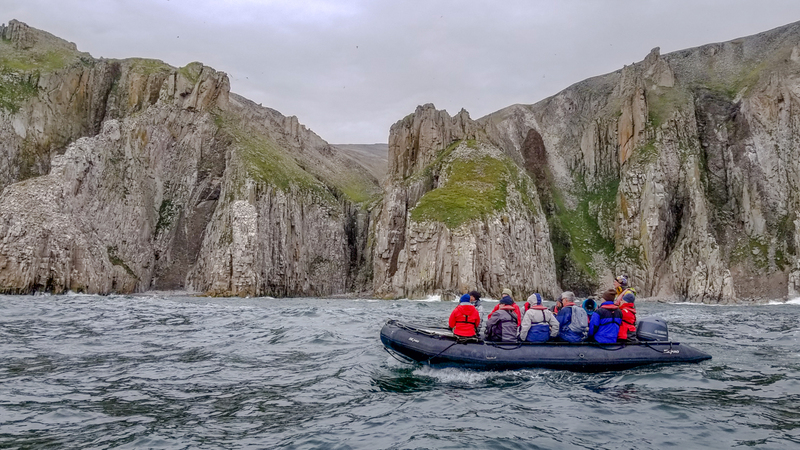 The water in Presbrazhenya Bay was quite rough and challenging for some of us, however we got a first taste of the vast Chukotka coast with its beautiful cliffs and mountains, and the rich bird life. Once the fog lifted during the early morning we went ashore at Yttygran Island. 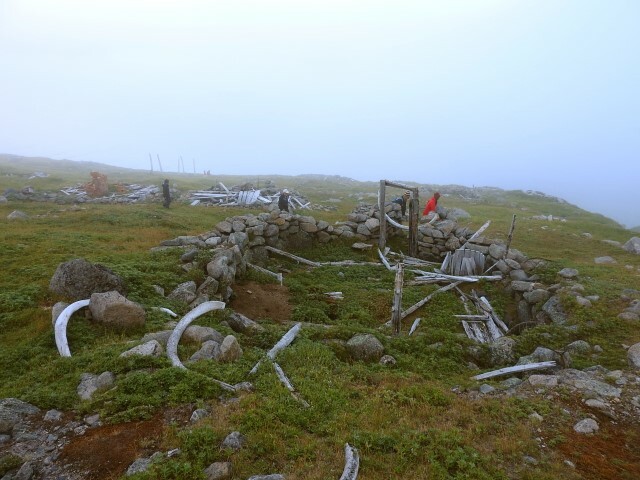 To the right of the landing site we already could see the famous Whale Bone Alley, and the ruins of the abandoned Yupik village Siqluk were to our left. A group of rangers welcomed us. As soon as we all were ashore Oksana and the ranger Nikolai, who was of Chukchi origin, took a group each to guide us along the shoreline. People from Siqluk were resettled in 1950, in connection with a huge state-relocation project. Whale Bone Alley was not discovered by researchers before 1976. Nobody knew about the precise meaning of the alley, not even the Yupik of the area. It is assumed that it could have been a traditional meeting place or hunting camp. 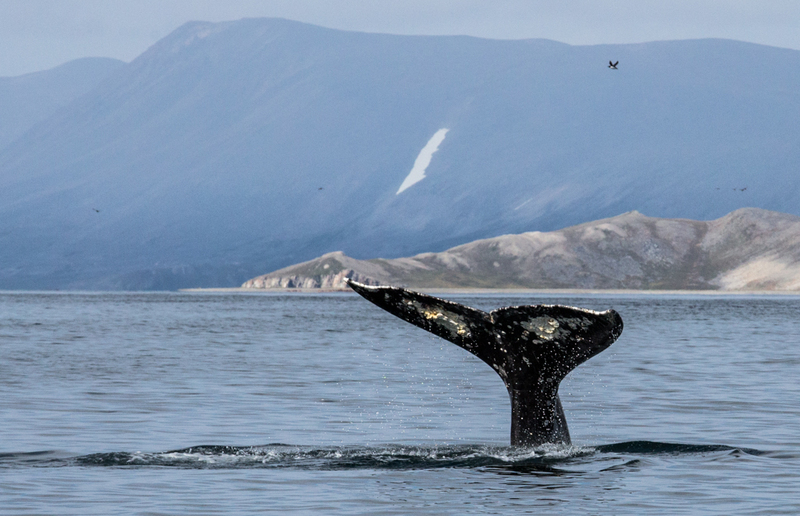 The Senyavina Strait is rich in marine wildlife such as walrus, Gray Whales and Humpback Whales. When the hunt was poor, people of the area met at Yttygran Island and exchanged necessary belongings and preserved the meat in 120 meat pits at the alley. Later we either enjoyed the time close to the alley or went on a little hike to a view point on our own. 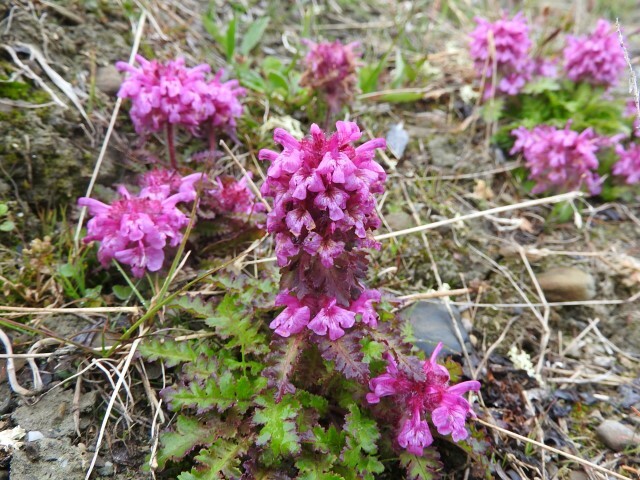 On the way the vegetation changed, and we found lots of different flowers. Also growing was a huge variety of berries, such as bilberry, crowberry, cloudberry and Arctic blueberry, the food for the numerous Ground Squirrels that had their burrows almost everywhere. Even from higher altitude we could hear distant whale blows. Helen decided to add a Zodiac cruise with Gray Whales to the landing, some whales came close to Zodiacs, the noise of their blows was the only sound within a couple of kilometers. Some of us were lucky and viewed a breaching whale just before we returned to the ship. After lunch we visited a place called Gil'mimyl, which means “hot water”. Here the reindeer herder Ivan and his son Alexej, a ranger of the National Park of Beringia, waited for us. We were invited to their jaranga, the house of the reindeer nomads of the region. At a camp fire we could try fresh caught seal meat (intestine, liver, meat, and blubber), halibut, salmon and caviar in addition to traditional salad out of Seabeach sandwort (Metet). Aside they offered traditional Chukchi bread (kavkav) made of flower, water and baking powder. Close to the jaranga and the houses a family of Ground Squirrels observed us playfully. We also joined some natural guided walks with Alex or Moshe to learn more about flora and fauna. On the way some of us spotted some exhausted salmon. Later we passed by the natural hot springs, that gave the site its name. The water in the wooden framed pool was too hot to enjoy, so those of us who wanted to test the water went to the nearby creek instead and tried to find spots with mixed water to take a bath. Back on board we joined the recap in the bar, where Moshe, Oksana and Elke gave us a lot of information about the plants we have seen on the way so far, the life of the reindeer herders in Chukotka and the biology of the Gray Whales that differ so much from other whales; and are the main food source for the marine Chukchi hunters. Early in the morning we were met by Alla and an official person at the beach of the village Lavrentiya. Alla led us to the city square and the sculpture “Peliken”. This modern monument is sold as “God” of the Chukchi people, although it is not – its origin is China – the natives used to have several different spirits instead, but they adopted this new one which is said to bring luck to people that touch its belly. Aside the monument another artwork was placed; a wooden Chukchi calendar, this shows all the necessary work that is required during the twelve months of the year. We split into two groups so we could fit into the tiny museum. Alla guided us around and we learned about the wildlife and traditions of the Chukchi nation. Even a mini-baidara, the typical open skin boat found its way to the exhibition. At the square locals exhibited crafts and souvenirs. Two competing families offered traditional food (berries, Gray Whale, cake, fish) and wanted to find out who could satisfy the strangers best. Some of us even joined in a volleyball game with locals. The visit finished with a performance by the local folklore group “White Sail”. Three drum players with big walrus skin drums were singing while three young girls dressed in traditional Chukchi cotton dresses, the “kamleika”, were dancing. These dances talked about daily life activities, such as duck hunting or imitated local animals, for instance raven or walrus. As soon as we were back on board we started sailing out of the St. Lawrence Bay. On the way we came across some Gray Whales again and some of us enjoyed the sunny weather and the great view on the outside decks. The day was packed with activities, as soon as we were well fed by our skilled chefs again; Oksana offered some information about the region we would visit later and the people that lived there. Yupik people inhabited the exposed village Naukan with its majestic views until 1958. Within the process of centralisation of native people during Soviet times these people were forced to leave their village within a few hours and without hope of return. Today lots of ruins are left only from a flourishing community of about 350 people once upon a time. When we finally arrived at Cape Dezhnev, thick fog was hiding the coast from our eyes. However, as we tried an attempt of landing the clouds raised and we landed on a relatively clear beach. We had to walk up a steep slope to reach the remains of the village. In the distance the beautiful light tower pointed out the direction we had to follow. At the lighthouse we visited the memorial of Semyon Dezhnev, a Russian Cossack that sailed for the very first time in 1648 through the Bering Strait. We arrived at Kolyuchin Island after a nice late breakfast. The weather was calm enough to let us go ashore at the former weather station. The top of the island was covered by polygon ground so we had to be careful where we placed our feet. We passed the abandoned station and were welcomed by hundreds of guillemots, and clown-faced puffins, it was nice to see the puffins against the wild water of the surge at the foot of the cliffs with their wings out spread. 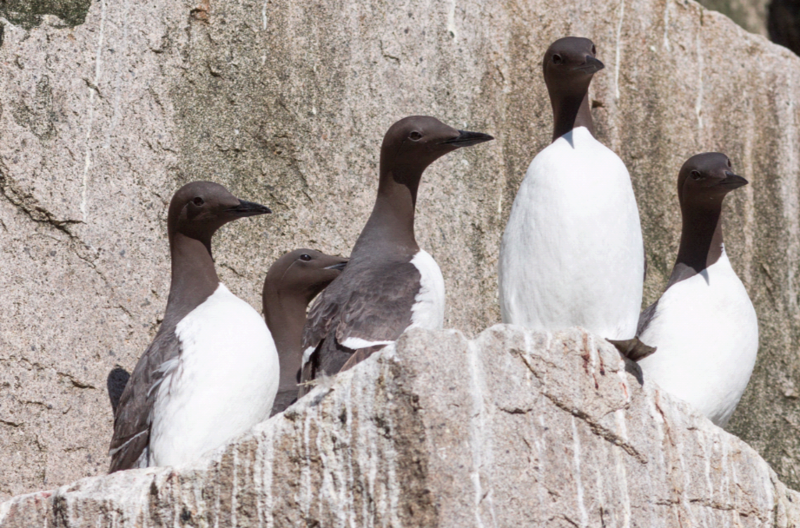 Some guillemots tried to hide their chicks from the wind and the patrolling Glaucous Gulls. Quite a few eggs must have been victim to these predator seabirds during the season, since we could find quite a few empty egg shells. The ground was covered with large scurvy grass tufts, favoured by the amounts of guano around. We spent two hours ashore and the time passed too quickly, most of us could have happily stayed and enjoyed this little bird paradise for longer. We returned to the ship and heaved anchor, setting sail towards NE. As we crossed a shallow area we suddenly saw hundreds of Short-tailed Shearwaters in clouds on the sea at the horizon. Here and there we could spot some whale blows within the bird flocks. Many Humpback Whales gathered here with the birds in the nutrient rich waters and had a feast; we spotted flukes and blows and backs, and occasionally also breaches all around us. How much fish and plankton must have been below the water surface that now looked like it was boiling of feeding whales and birds! After this nature spectacle Alex invited us to a lecture about expedition photography. Later at recap he told us some facts about bird eggs and why they look as they do. This morning was a lazy sea morning. Those who did not want to wait until the late breakfast had already taken some fresh air on the outside decks earlier. The sea was smooth but some swell kept the ship moving all night and morning. Most of us had grown sea legs by now. Helen gave us an interesting overview on Wrangel Island later on, followed by Alex who presented the Polar Bear safety rules we would have to follow from now on. Before lunch the gift shop opened and we were able to purchase a variety of souvenirs, postcards and books. At noon we arrived and anchored in front of the ranger settlement at Doubtful. As we arrived ashore we were met by the local rangers and Scientists, they then also joined us on our two walks. The settlement itself looked quite a bit dirty, but all the colour dots of the rich flora made up for it. In the riverbed we met the spider-plant. Blue groups of forget-me-not and yellow flowers of Arctic poppy and saxifrage, as well as purple flowers of Elegant paintbrush and Lousewort species covered the meadows between the houses and the riverbank. Some young foxes displayed cheerfully for the slow hikers in the village, whilst the long hikers spotted Snowy Owls and Musk Oxen in the distance on their way. 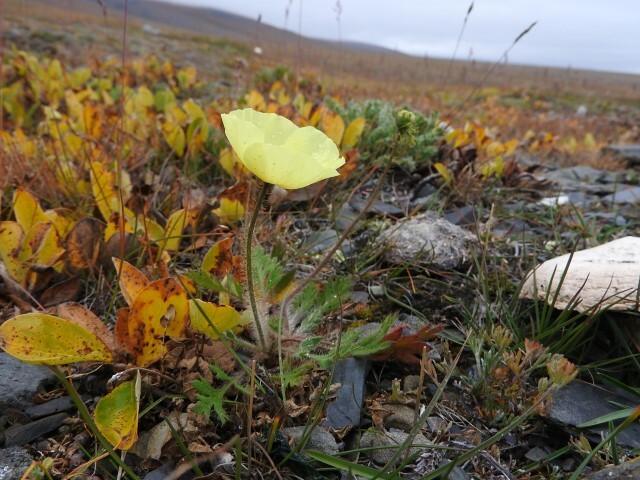 We finished on the old side of the settlement, where again we found stunning flora and also could visit the rangers house, with mammoth tusk and Musk Oxen skulls in front of it. We all returned to the ship leaving only the first five “Overlanders” and Julia on land in Doubtful Village, they would stay here over night and start a completely different two days journey the next day. After dinner we all went out for a Zodiac cruise close to Cape Blossom. It was already fairly late and the light faded while we were traveling along the coastline, however we got a first good glimpse on six bears close to the coastline, knowing that there were eight more somewhere on the tundra behind. During breakfast we received information that there were about 50 bears spotted ashore. Most of them where resting on the slopes whilst others walked along the tundra. Unbelievable this density of bears! The area around Mt. Thomas is a well known denning area for Polar Bears. By the late 80s the number of dens on Wrangel and Herald Island was estimated to be 350 to 400. From 2004-2010 less than 60-70 dens were left, tendency decreasing. 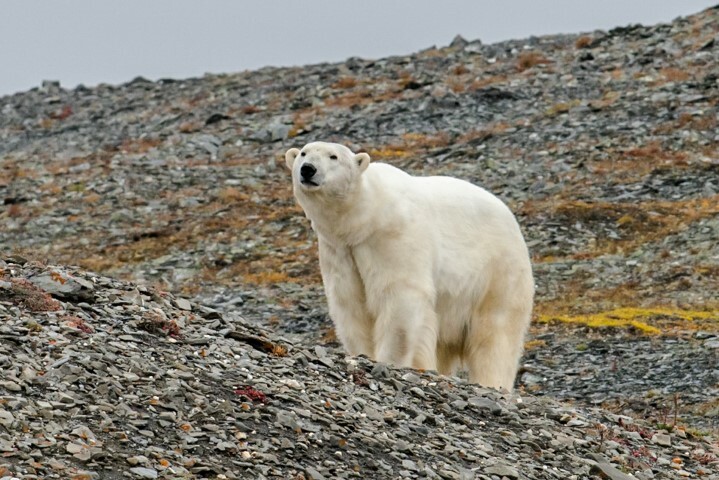 Newer numbers are lacking, because the Polar Bear observation program on Wrangel Island finished a few years ago and no more Polar Bear specialists have been there in recent years. We landed at the monument where the Russian Vaigatch-Hydrographic-Expedition planted their flag in September 2011. The long-hikers went off with the Ranger Genadi and Alex to stretch their legs, on the way they met three bears within a fairly good distance, two of them adventured down the slope to check out the colourful human herd that came strolling along. The short hikers made their way to a lake with a well weathered cabin. On the way we found Seabeach sandwort and the Oysterleaf-plant mertensia, both belonging to Saltwater resistant flora. A Lemming ran across the tundra as we were learning about the polygon soil and permafrost patterns. On the beach we found a sleeping hollow with some beautiful Polar Bear tracks. During lunch we took a Zodiac cruise to a place called Ptichy Bazar or “Bird market”. Hundreds of Black-legged Kittiwakes were still sitting on their breeding ledges and quite a number of Brünnich's and Common Guillemot were still at home. Around the corner of the bird cliff we found some Polar Bears, some resting on the slopes and others slowly moving across tundra or shore line. Even a small Arctic Fox appeared in front of our Zodiacs. The grand final of that one hour cruise was a well fed female bear coming down to the shore line, strolling along and at the end rolling and stretching herself on a snow field. After a quiet night we woke up in front of the very low cloud covered coast of Wrangel Island. Helen wanted to wait, hoping the fog would lift, so we started with a lecture on penguins of the North with Elke after breakfast. 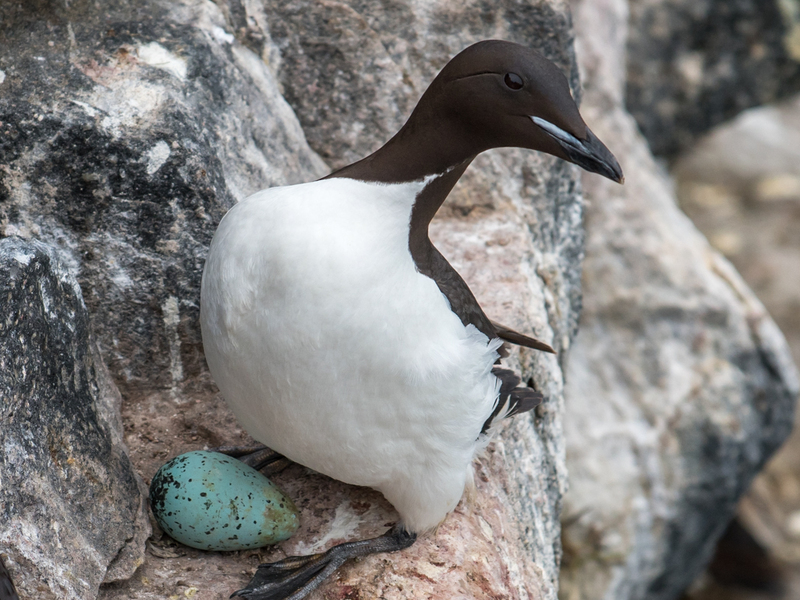 We learned about breeding biology and behaviour of guillemots and puffins, numbers, distributions and adaptations to their environment. Considering the cold, icy environment of both polar areas, a whole ecosystem and its species has developed by convergent evolution. Penguins and their prey the krill play the same role and look very similar to the auks and the amphipods in the Arctic environment. Before lunch Helen decided to try a short one hour landing at Lake Komsomol. At times fog covered the landing site, and other times it lifted completely. We went ashore close to a cabin, which is sometimes used by researchers counting Polar Bears in the area. Close by some bears were resting, we walked a bit in their direction, always keeping the water of the lake between us and them, like this we could nicely observe their interactions or just enjoy the busy Red-necked phalaropes along the shoreline. While we were observing the bears at a little peninsula, another bear showed up at the landing site. We slowly walked back whilst the bear investigated the cabin and shed close by. As we came closer to the life jacket bins, the bear decided not to stay close and moved on. After lunch Moshe, our expert and botanist, lectured about the vegetation zones and the geo-historical development of the Beringia land-bridge, a wide range of land that connected West-America and East Asia. This area was almost non-glaciated during the last glaciation period and thus provided a unique habitat for cold, arid steppe-like flora and mega-fauna. A mixture of American and Eurasian plant species evolved here, and in the middle of everything, the nowadays Wrangel Island was embedded. Not before 60000 years later global water level rose and the Bering Sea developed. By that time the first Paleolithic people had conquered the American continent. A swell along the shoreline just allowed us to exchange our “Overlander” groups, so instead of a landing we took the opportunity to spend a quiet day on board catching up on photos, chatting with new friends, or reading books from the library collection. Many of us attended the onboard ‘cinema’ in the lecture theatre and watched the Wrangel documentary “Life in the field of bones” by the BBC and Nikita Ovsyanikov, who once worked and lived here as a Ranger and was a Polar Bear expert and scientist on the island for many years. 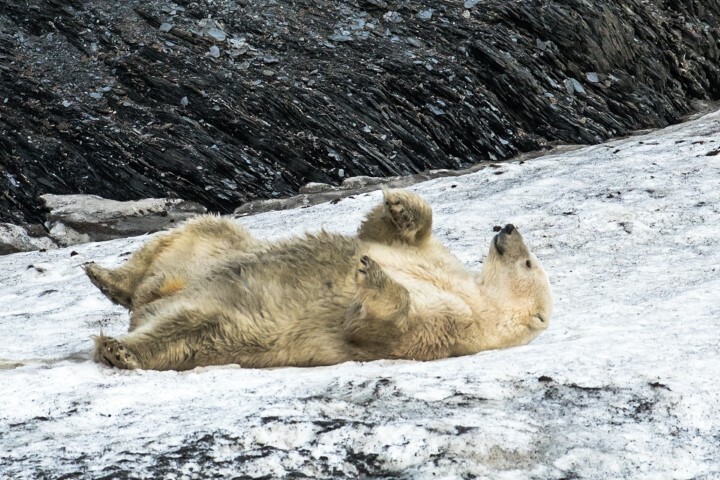 During the recap we learned to see the difference of Polar Bear sexes and to judge the body condition of bears as well as interesting facts on the Karluk Expedition (1913-1916) that ended more or less disastrous around Herald and Wrangel Island. Of the 31 members 11 died, before the remaining members could be rescued. We woke up at five this morning for an early morning Zodiac cruise, despite the early morning wake-up as soon as we boarded the Zodiacs it wasn’t long before the temperature and wind woke us up. We left for a little walrus haul out close to the shore. As we approached we could see there was another visitor, a Polar Bear, as we got closer the bear walked off, entering the water swimming past the walrus. We spent a couple of minutes watching the interactions of the animals in the water and the roughly 100 walrus individuals ashore then we continued along the coastline. Steep granite rock formations changed with banded gneisses further towards the South Cape, while the cape itself consisted of well weathered granites again. 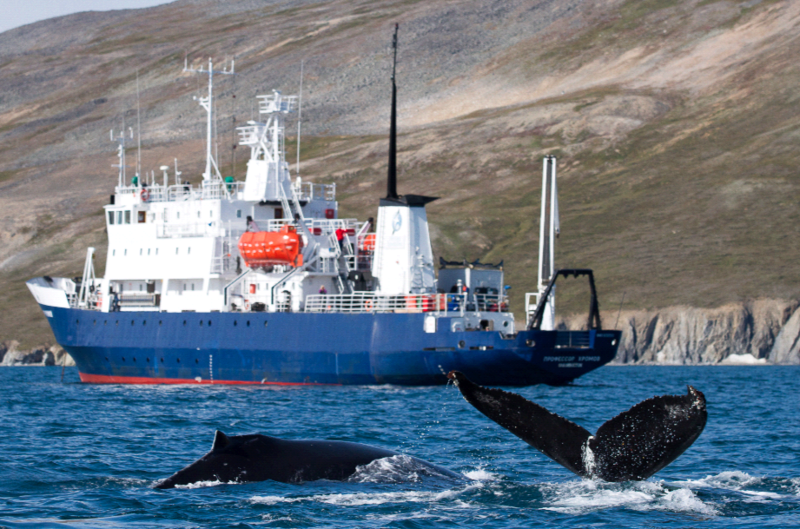 During the morning we transited back to Wrangel Island, arriving at Cape Waring at noon. Helen waited for the swell to reduce, and decided to continue our voyage south. The next bay however offered better sea conditions and on the way there we were even accompanied by a few Gray Whales and walruses. Around 2pm we were ready on the gangway to join a Zodiac cruise with some of the walruses we had seen. While we were waiting a flock of cranes circled above the ship with loud trumpeting noise, and also a Polar Bear showed up at the shoreline where we headed first, this male bear decided to walk away as our Zodiacs approached. We also had a stop at a little haul out on the coast, where approximately a hundred walrus rested like big sausages on a little rock and along a boulder slope. After this visit the Zodiacs spread out to find a little group of walrus each to observe them. At the northern end a Gray Whale fed on the soft bottom fauna, and showed himself once in a while. Closer to shore a huge karst arch reached out into the sea. At a nearby shore we found a Polar Bear resting, as we drifted closer he raised and lay down again, and then finally walked slowly off towards the northern end of the beach. Back on board Spirit of Enderby we warmed ourselves up again before we watched a movie about the Karluk expedition. Danila, out Russian walrus researcher rounded the evening up, providing us with some information on Pacific walrus ecology; this was well received by all who were listening. Having spent time observing them in the water earlier it was a great way to end the day. The weather remained the same as during the last few days: overcast. 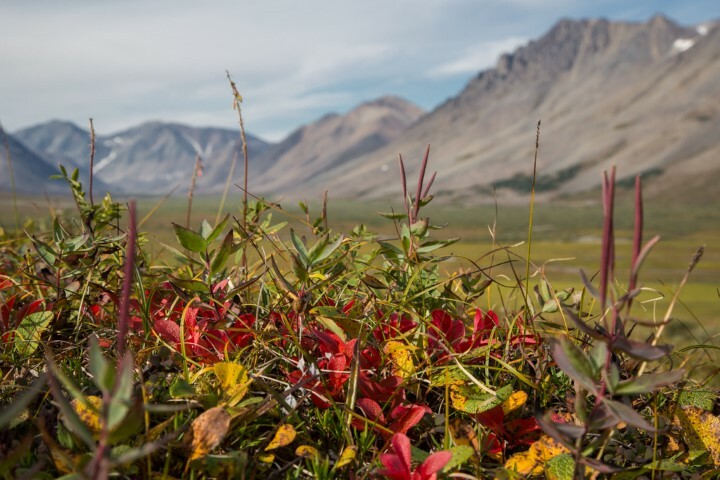 We could observe that the tundra had changed slightly with autumn colours starting to paint the tundra in additional red and yellow. We went ashore at a Paleo-eskimo site that is believed to be about 320,000 years old. Archaeologists found remains of a summer camp only here, parts of hunting gear and tools have also been found, this is the only known site of its kind at Wrangel Island. Splitting into various groups again we conquered the slopes to find some wildlife and flora. The strong hikers reached quite some altitude, as far as the cloud cover allowed, from here a few Snowy Owls and also some Polar Bears could be spotted in the distance. A fox den was discovered on the way as well, and most of us got a glimpse on the little fellow playing in the ravine. Plant life was rich at this spot. Heathland and wetland interchanged with each other. Fleabane, Saxgifrage and Cinquefoil were still in bloom here and there. At the lower tundra a few Musk Oxen carcasses were found. The journey back to the ship in the Zodiacs was rather rough, but most of us managed to get home more or less dry. Due to an increasing wind and swell a second visit to Doubtful Village was cancelled. We waved goodbye to the Rangers that had accompanied us for the last days. The Overlander participants were still to be picked up ashore so plans were made to collect them, as they arrived back at the Spirit of Enderby they were more or less soaked, such waves they had to face at the beach. Meanwhile the rest of us had stayed warm and dry, and enjoyed a lecture by Moshe about vegetation zones of the world and plant life in the area while the waiting for the Overlanders to return. In the evening we met for a final Wrangel Island recap. Elke provided a summary on the geology of Wrangel and Herald Island. We learned that both islands were part of a platform about 570 Million years ago that belonged to the Canadian shield. Mainly sediments and metamorphic rocks determined the geology of Wrangel whilst Herald Island consisted of a large amount of igneous and metamorphic rocks. 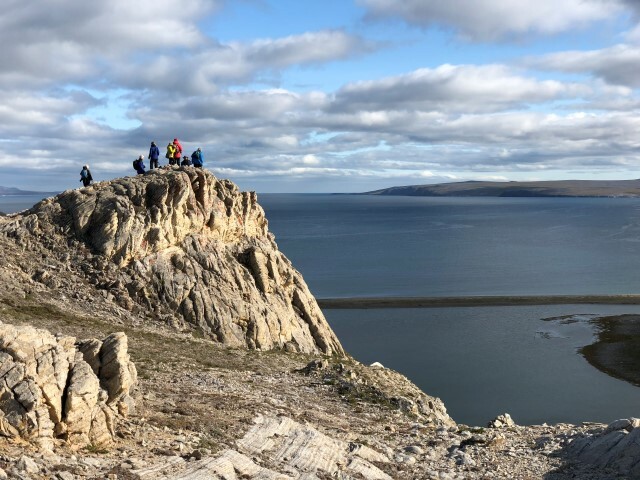 Also those that participated in the Overlander Traverse extension talked about the adventures that they had during their time staying on Wrangel Island. In the morning we arrived at the northern coast of Chukotka, close to the walrus hunter’s village Vankarem. The place is important for its walrus haul-out nearby. During high season 25-30 thousand walrus can rest on shore. Whilst on shore we met the Ranger Sergej of the national monument of Cape Vankarem. He is also the indigenous representative of the Chukotka and Alaska agreement on Polar Bear management and use. He guided us towards the far end of the peninsula, where we split into two groups. At the final observation point, small groups of five got the chance to have a close look at a tiny haul out location between the steep coastal cliffs. A few males and a female were resting on the boulders. Not too far away a larger group resettled on their tundra beds with loud noises and a few tusk battles. Out in the sea mother and calf groups and some single males were patrolling along the shoreline. The second half of us had spotted some Ground Squirrels while waiting. As we were resting and exploring between the ruins of a former military and scientific camp site that even earlier used to be a seasonal hunters home – the funny squirrels rushed up and down the boulders that covered their homes. Once back on shore, we said goodbye to our scientist Danila, who would stay together with the walrus and do some more research for the following two months. We spent this afternoon at sea. Oksana had brought a movie about the Chukchi reindeer herder Vukvukay, his family and his reindeer. Later, when we passed shallow areas again many Short-tailed Shearwaters as well as plenty of whale blows marked the feeding ground of numerous Gray Whales and Humpback Whale. At one stage we could even watch them breaching. This morning we entered St. Lawrence Bay again and passed by the village of Lavrentiya. Orcas were spotted from the bridge. We went out as quick as possible to catch a glimpse of these impressive animals and discovered several pairs or single individuals. A male with his sensational big fin came closer to the ship, and at the same time a female and a male crossed right in front of the ships bow. On the way we also passed some Gray Whales and a happy breaching Minke Whale. Lucky person who had the camera ready at that time! After lunch we went ashore at a sandy beach. Alex headed off almost immediately with the long-hikers and conquered the surrounding hills during the next three hours. The others tried to reach the nearby hill, crossing the swampy tundra with all its tasty cloud berries and fluffy cotton grass. It was not easy to walk through that terrain, but we all tried to reach at least some altitude to get some nice views. On the way, a brown bear was spotted in the distance, its excrements were scattered across the tundra showing that he had been feasting well eating all the available berries. After the landing Oksana provided a lecture about the whaling history of Chukotka: Natives here are still hunting, since whale meat is not only traditional food but also fresh and cheap meat. The meat can be stored in freezer containers or in cellars cooled by permafrost. 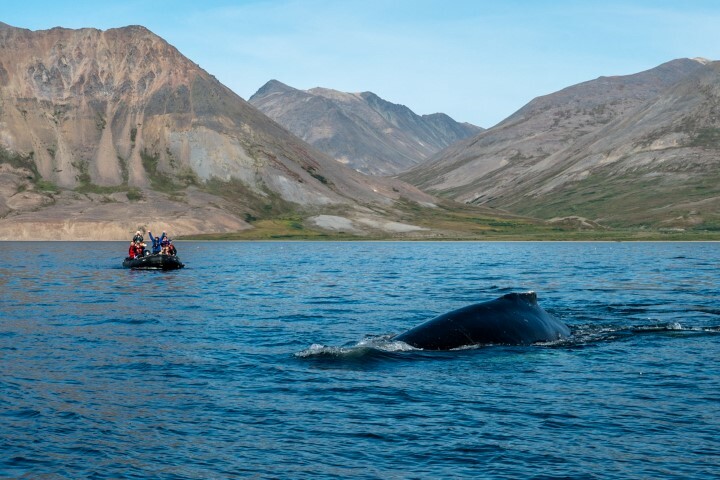 About 350 hunters are living in about 14 whaling villages, with their small boats they hunt about 125 Gray Whales and 5 Bowhead Whales per year. Our daily recap was very educational again: Moshe told us about his project on ducks eating and digesting seeds, that without the birds digesting system they would not germinate. Elke presented some interesting facts about walruses, how they would jet-stream the mud off around their clam-prey and how they use their tusks to pull themselves on shore or onto the ice. Interesting that walrus juvenile are nursed for up to two years, and the milk is pressed into their mouth by the mother. Alex finished off the educational meeting with information on the bird migration of Arctic birds. After breakfast we went on a Zodiac cruise with Humpback Whales, every Zodiac found their own group of whales with some of the whales coming close. It was a wild experience to hear them breathing when they broke through the water surface. Lots of beautiful flukes were displayed and pictures taken on memory cards, a few of us were very lucky to see a frequently breaching whale close by. After a short bathroom brake back on board the ship we went to shore. Here we could choose to take a long walk with Alex or just enjoy the sunny landscape on our own. Mats of crowberries covered the ground. Ancient summer camp stone rings were found on the rolling hills to the east. The creek offered a superb variation of the local flora and some nearby stone runs were home to the small Pika. The wind picked up during the landing, so almost nobody took the chance of the offered swim in the clear but cold waters. After lunch we sailed out of the bay again. We hoped to see more of the breaching whales but the wind had gotten very strong and we mainly spotted a blow or the tail of a diving whale here and there. At the recap we learned about Orcas. 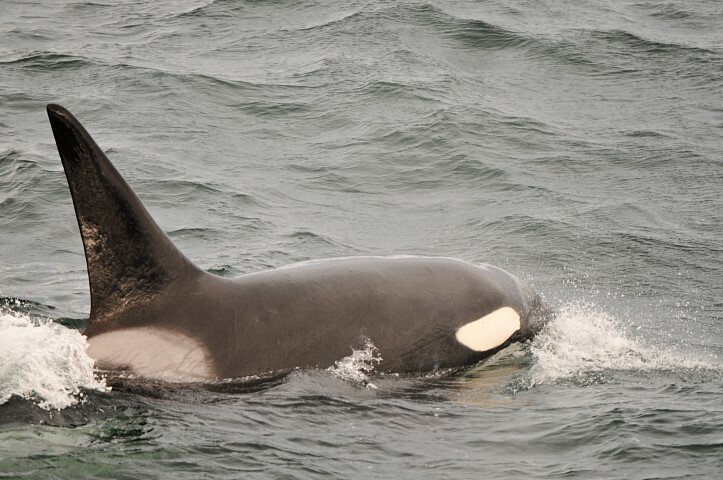 The ones we had seen yesterday belonged to a group of transient animals that are mammal eaters, such Orcas use to hunt migrating Gray Whales and Minke Whales along the coast by drowning them. This morning we got a little sleep in again, before our on board university courses started with Oksana. She led us through the various festivals of indigenous people of Chukotka, giving us a great insight into the Chukchi culture. The most common event seemed to be the skin boat races and the dog sled races. 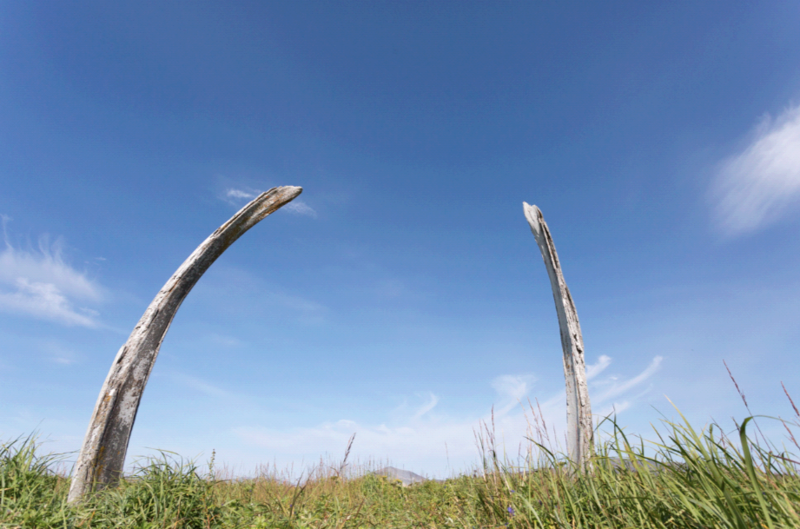 Yupik people once taught the Chukchi how to built skin boats of wooden frames from driftwood and a single walrus hide. Skilled men would divide the 3cm thick hide into several thin layers and after some processing fasten them to the wooden frame. Teams of hunters, women or young boys would compete with each other in a 10km race during a festival. Meanwhile all other festival visitors can join in various sport games or eat local delicacies, or buy souvenirs. The dog sledge race is organised by the marine mammal hunters in March or April. Weather depending they start in Nome and either travel along a northern or a southern coastal route towards Anadyr, only the Bering Strait is taken by helicopter. The race is a social event, where locals are proud to house the musher and learn about the happenings in his village. When the musher arrives he just has to provide a kettle, otherwise firewood and frozen walrus meat is provided to feed him and his dogs. After Oksana’s lecture we had a group photo on the front deck, and then Elke provided the last lecture on this voyage. She gave us an overview on plant adaptations to the cold environment; as the temperature decreases some species attain complete frost resistance within just a few hours. Plants from other climatic zones must be exposed to low temp for a much longer time. Vegetation of snow layer habitats has a lower frost resistance than plants on windblown ridges. Hairs, dead plant material and red plant color protect the living plant parts that have to be exposed to the cold for photosynthesis. The main biomass in polar habitat is below ground, despite the permafrost soil. The afternoon was spent exchanging last pictures and information with our fellow travellers, enjoying the sun and warm temperatures on the outside deck or already starting to pack for those of us who would have to return home tomorrow. Oksana had prepared a nice slide show and presented it for us as a review of the voyage. 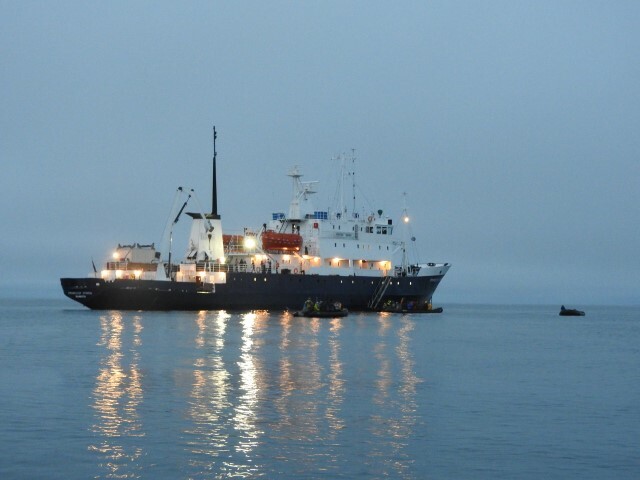 Helen finished her last recap, we received more detailed information about the disembarkation day tomorrow for some of us, or the excursion day for others that would continue their travel with the ship towards Kamchatka. During our four course delicious farewell dinner we moored to the pier at the northern side of the Anadyr River, our last night on board Spirit of Enderby. After a final breakfast, passengers gathered and said their goodbyes before those leaving Anadyr transferred to the airport. During this voyage we have sailed a total of 2080 Nautical miles, observed 76 Polar Bears and one brown bear. We have had great encounters with Gray and Humpback Whales, and enjoyed the opportunities to view walrus on land and in the water. Heritage Expeditions thank you for travelling and sharing these experiences with us on ‘Across the Top of the World’, we hope to see you again somewhere between the poles! Weather: Light SE breeze, 12-17°C. Expeditioners from all parts of the planet - Russia, Germany, Switzerland, U.K, U.S.A, Australia and New Zealand - were welcomed on board the Professor Kromov (a.k.a. Spirit of Enderby), shown to our cabins and offered drinks, a cheese platter and fresh baking. Soon after, Rodney Russ our Expedition Leader and the founder of Heritage Expeditions, welcomed us aboard. Rodney had sketched a map of the region on the whiteboard. Chukotka is one of 88 Autonomous Regions in the Russian Federation and contains 737,000 square kilometres. It is the farthest east part of Eurasia and travel is by permit only. We headed across Anadyr Bay and for our first landing at Preobrazhenia Bay. The plan for the next day was to visit Yttygran Island, the village of Larentiya, then on up the coast to Cape Deshnev and Naukan Village. From there we aim to turn west and head along the coast to Kolyuchin Island, then north to Wrangel Island. Our 15 day voyage into one of the most remote and wild places left on earth began - Chukotka in the Russian Arctic. Our starting point of Anadyr is a frontier port town without a land-link to the rest of the country, populated largely by coal-miners, administrators, the military and indigenous Chukchi. To the west is a vast and virtually trackless wilderness of tundra, wetlands, lakes and rivers for thousands of kilometres. Moscow is 8 time zones to the west, or as they say locally, “God is a long way off, but Moscow is even further”. Nature highlights: Seabird cliffs of Preobrazheniya Bay. First walk over the tundra. 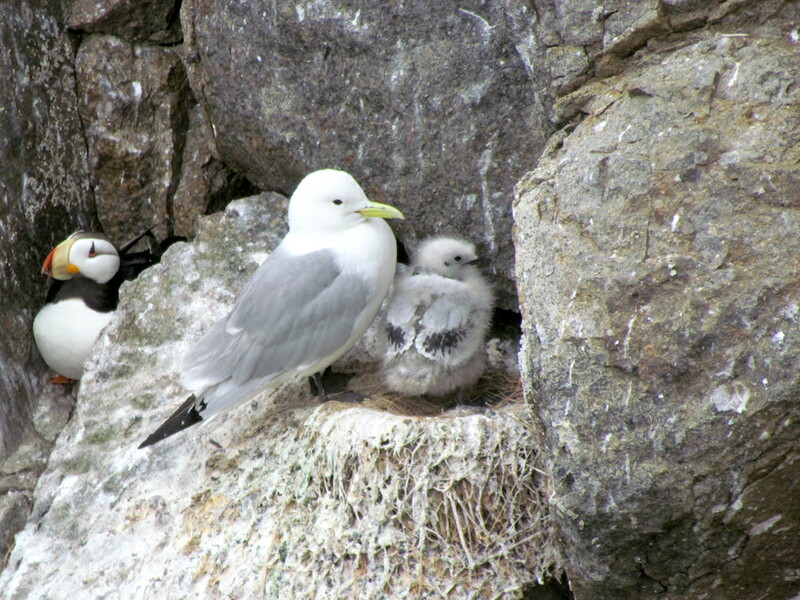 Lectures: Introduction to the seabird cliffs by Sarah. Zodiac boarding and landing briefing. Breeding seabirds occupied every possible and many seemingly impossible ledges and crevices of the Preobrazheniya cliffs. Flying seabirds streamed in all directions. Tufted and horned puffins flying to their young with rows of small fish hanging from the sides of their bills. Guillemots carrying theirs back tail frontward one at a time. A colony of inky black pelagic cormorants occupied the top shelves of an isolated tor. Pairs of kittiwakes, delicate grey with black wing tips, protectively cloaked their fledgelings against the rock face from the predations of skuas and glaucous gulls: A glaucous gull stood sentinal on a nearby promomtory flanked by its full-sized fledgeling apprentices, watching and waiting for an unguarded kittiwake nest to rob, or for a chick to lose its footing and tumble down. A cluster of harlequin ducks hugged the surge line at the base of the cliffs, bobbing around like ‘rubber duckies’, their tiny size incongruent with the powerful elements they lived amongst. We motored around into Preobrazheniya Bay, landed by zodiac on the stony beach, and ambled upstream and inland for a look around. Most people headed for the knob at the eastern end of the beach, overlooking a long shingle spit and lagoon, the ship at anchor, and inland across the tundra to the mountains. Think of an undulating plain of grasses, edible berries and mushrooms, the sharp scent of herbs underfoot, ground-hugging willows and birches, ground squirrels, and a clear stoney stream. Then imagine that it stretches out without fences or roads almost as far as the imagination allows. It is called tundra and it is simply magnificent. Places visited: Yttygran Island: Whale Bone Alley and around the eastern end by zodiac; by zodiac to Nuneagan (‘Bird’) Island; Gilmimyl community, tundra and hot springs. Wildlife highlight: Ground squirrels, a fox, lots of birds. Lectures: Pre-landing briefing by Rodney on the day’s plan. the archaelogical site known as ‘Whalebone Alley’. Other highlights: There she blows: Whales galore! ‘Bird club’ in the bar, with a run-down of the day’s wildlife sightings. A: Visit a Chukchi family with Katya and Chris, followed by a soak in the hot pools. B: Go birding with Agnes and Samuel, followed by a soak in the hot pools. C: Go directly to the hot pools, led by Rodney. Gilmimyl, once a permanent Chukchi settlement, is now used by only a handful of Chukchi and Eskimo families as a summer residence. Situated in a spacious basin, it has plentiful food resources available from sea, lagoon, river and tundra with subsistence food gathering still being allowed for in the national park. So while some of our Russian crew scoured the hillsides for mushrooms, the rest of us peered at birds, chatted with a Chukchi family or simply soaked in the large timber-constructed hot pool, which was fed by a thermal spring in the hillside and situated close to an ice-cold river for cooling off. Places visited: Lavrentiya Village. Sea too rough to land at Cape Dezhnev, easternmost point in Eurasia. Weather: Southerly wind 10-17°. Sea temperature 11°C. Sea conditions: Calm in morning, 1m swell in the afternoon. 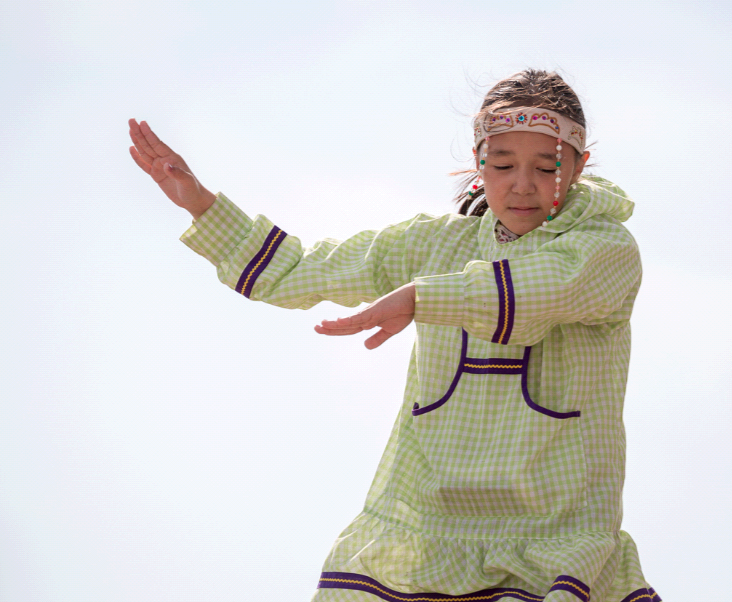 Cultural highlight: Chukchi cultural dancing at Lavrentiya. Lectures: Katya on Chukotka history and culture. After 4 days of entirely natural landscapes, the boxey Soviet-era apartment blocks of Lavrentiya seemed sharply incongruent with the gently flowing horizontality of the tundra. We landed on the gravel beach by zodiac to visit the museum, a small outdoor market (postcards, sealskin slippers, walrus-tusk pendants) and to sample the local fare of smoked wild salmon, cloudberry and blueberry jam, gray whale meat (caught under a subsistence quota system) prepared several different ways, including marinated with bitter tundra herbs, and sweet black tea. Elizaveta our guide at the museum was born in a yaranga in Naukan Village at Cape Dezhnev and spent her childhood there before the Soviets disbanded the village during the Cold War. Her life represents a transition from subsistence hunting with whale blubber lamps to apartment living with coal-fired heating and electricity. She talked of the history of the paleo-Eskimo communities around the coastline (the first human settlers there), the later arrival of the Chukchi peoples and the gradual development of reciprocal exchange between their communities; mainly marine mammal products for reindeer products. As a finale, a local troupe performed traditional Chukchi dances, accompanied by singing and walrus-skin drum percussion. The dances represented the every-day reality of a marine-mammal hunting community: walrus behaviour, walrus and whale hunting, the sharply observed behaviour of ravens and gulls, gathering birds’ eggs from the sea-cliffs, friendship and courtship. Expeditioners were kindly invited to join in the last dance. Conditions at Cape Dezhnev were too rough to land, the sea a mass of white-caps and the Cape wreathed in mist. After rounding the Cape the ship headed west toward Kolyuchin Island in 2-3m swells. 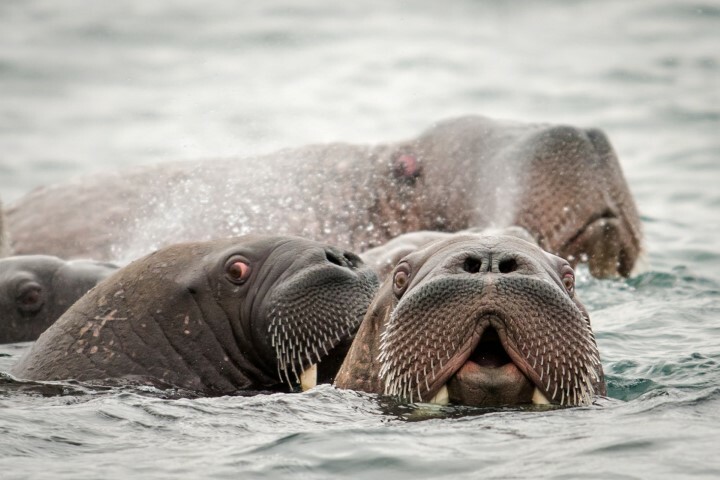 Wildlife highlight: Walruses in the water around Kolyuchin Island. Lectures & Briefings: Agnes on Walrus Biology and Behaviour. Rodney on Kolyuchin Island and the prospects for the day. We reached Kolyuchin Island at 0500, anchoring in the lee to protect us from a strengthening nor’west wind. Rodney and Samuel went ahead by zodiac to assess the sea conditions for landing and check the abandoned weather station for resident polar bears. The landing was deemed unsafe so instead we watched a walrus haul-out on a bouldery beach at the northern tip of the island. A group of perhaps 20 walruses, mostly curious young males, rafted out to play ‘chicken’ with our stationary zodiacs, creeping in closer and closer to the boats, their tusked whiskery heads and bloodshot eyes above water watching us closely until each time one would suddenly panic and they would all dive together, emerging again a little farther off each time, before creeping closer again, the bravest to within 2-3 metres. Unable to land, we set off after lunch for Wrangel Island. 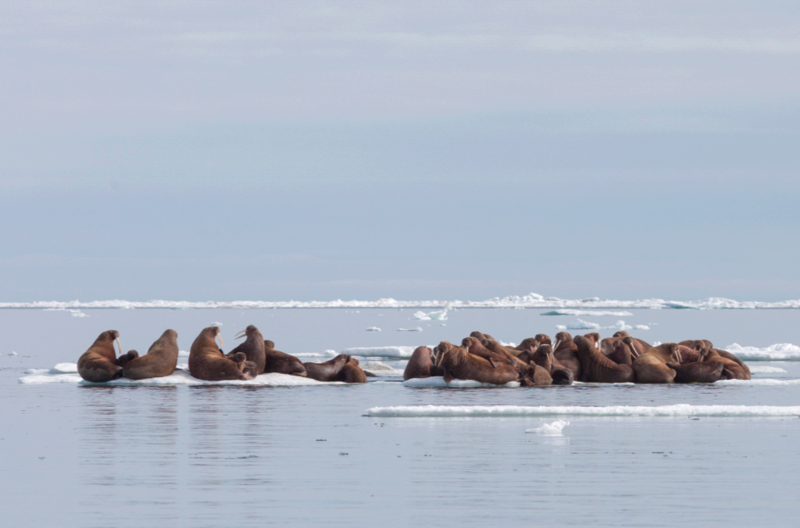 Wildlife highlight: Groups of walrus mothers and cubs on the ice floes. Landscape highlights: First sea ice; combination of seascape, landscape and skyscape approaching Wrangel Island. Lectures & briefings: Agnes on Sea Ice, the Eighth Continent. Katya on Safety in Polar Bear Country. Rodney on Wrangel Island, the condition of the sea ice and prospects for the next 5 days. The sea approaching Wrangel Island was a milky azure-blue, studded with brilliantly lit ice floes. Some of the smaller floes looked like life-rafts, jam-packed with walrus mothers and calves. Then came an intercom message, ‘Polar bear on the ice to starboard!’, followed immediately by a general stampede to the rail. Australian Sue leaned into the frigid wind, “Oh my God this is so beautiful! Nothing could prepare me for this! I don’t even have any points of reference to take it in!” On the island ahead the tawny tundra plains stretched out to the dark mountains beyond, mist roiling toward us over the ridgeline. We anchored and went in by zodiac to the mouth of Doubtful Creek, a polar bear mother and large cub running down the beach and entering the sea as we traversed the coastline. We were joined on shore by local rangers Gennady, Anna, Lily and Sasha, who accompanied our 3 walking parties exploring the tundra. Signs of Autumn were everywhere - the frigidity of the north wind; the last of the yellow arctic poppies in bloom; a late straggling ‘V’of snow-geese heading south; the leaves of the tundra-hugging prostrate willow turning golden. A cloud-cap hugged the mountain tops and catabatic mist streamed down the valleys toward the sea, lit up by the late afternoon sun. We left a party of 4 behind to travel overland across the island by 6-wheeler, guided by Katya and 2 of the local rangers. The rest of us, including 4 local park rangers, headed back to the ship through choppy seas for a delectable meal and beautiful sunset. p.m Ptichy Bazaar bird-cliffs and Lake Kmo at the western end of Wrangel Island. Wildlife highlight: 10 polar bears and a herd of musk ox. Landscape highlights: Wrangel island tundra, mountains, ice-floes and sea-cliffs. It snowed during our very cold zodiac ride through the ice floes to Point Thomas at the western end of Wrangel Island, where we hoped see polar bears. After working our way upwind to the lagoon of Unexpected Creek, we eventually spotted a bear coming our way from several hundred metres up the coast. We landed quietly on the gravel beach and waited. The bear continued toward us, at one stage standing up to shake an old 220 litre drum. It came closer along the top of the beach. The bear strolled down the beach before suddenly noticing us, at which point it walked quickly down the beach, through a line of beached floes, entered the water and swam out towards an ice floe. Some of us then went back to ship to thaw out, the remainder staying for a stroll on the tundra, enjoying beautiful views back over the lagoon to the ice-dotted sea. The afternoon was so different that it felt like a separate day. The wind dropped off completely as we took a zodiac cruise under the sea cliffs of Ptichy Bazaar and threaded our way through the dense ice floes eddying beneath it. The sky was alive with guillimots, kittiwakes, glaucous gulls, pelagic cormorants and puffins - a deafening cocophany of chicks and parents calling for each other; kittiwakes perched en-masse on transluscent blue ice-floes. We motored a little further up the coast to Lake Kmo, with options for shorter or longer walks. Some of us walked up the creek a toward a herd of musk-ox we’d spotted on a terrace a couple of kilometres upstream. Once within shouting distance we slowed down and moved more quietly, every now and then stopping to take more photos in case they ran off. They finally sniffed us at about 200 metres and immediately went into a defensive formation; mothers closing ranks and facing outward with their calves behind or beside them; big bulls stepping forward ready to challenge us, not a welcome prospect given their enormous bulk, heavy horns and short tempers. We quietly backed off and whizzed back to the ship through the ice-floes for a beautiful venison stew. Up on the bridge at dusk Dima steered the ship through a maze of ice floes on a sea of glass, glowing pink and burnished bronze. Captain Alexandr analysed the apparently impassable ice far ahead through binoculars and quietly issued directions. We watched the scene unfold ahead of the bow for ages, mesmerised. Places visited: Komsomol Lake, Dream Head / Drem Khed. Sea conditions: Moderate swell, ice cover 30-70%, sea temp. 2C. Geographic highlights: The northernmost point of our expedition, 7140’N around the north coast of Wrangel Island. Zodiac trips: To Komsommol Lake and Dream head. Lectures: Agnes on ‘Sea Ice, the Eighth Continent’. Chris on The Last Voyage of the Karluk, a ship crushed by ice off Wrangel Island in 1914. With much distance to cover to reach Herald Island, we had a quiet day circumnavigating Wrangel Island through the ice, punctuated by a zodiac trip to the tundra to spot wildlife musk ox and polar bears, picking up the passengers who had travelled overland from south to north coast by 6-wheel drive from our landing spot at Doubtful, and dropping off a second group of 5 to return via the same route. Back on ship the ‘overlanders’ talk was all about arctic foxes, snowy owls, and breath-taking landscapes. Wildlife highlight: Bears, bears, bears: a 40-bear day! Our ship 'Spirit of Enderby' wound her way through innumerable ice floes, finally reaching Herald Island at 5am. We had reached this famously inhospitable intrusion of vertical granite. We launched the zodiacs by 0830 and made for the cliffs, threading our way between floes. Imagine a sea as smooth as mercury, punctuated by ice-floes of deep transluscent blues and greens where the sea has undercut them. A pair of cormorants rest on the ice, etched inky purple-black against a brilliant white canvas. And behind all this, granite cliffs heaving skyward, topped by scree-slopes and crested with a ‘dragon’s back’ ridge disapperaing upward into the mist. Just below the cloud-line a polar bear lay watching us to see if we posed a threat. Puffins and guillemots streamed down off the cliffs, falling at a 45 angle until their too-small wings find purchase in the cold air. A bear and cub lay on a distant ledge half way down a cliff. How on earth did they get there? We backed off in case they panicked, a little disappointed not to get closer, but soon enough we saw another, then a mother with 3 cubs crossing the scree high above; then a mother and cub ‘nesting’ in a snow hollow she has scooped from avalanche debris only 20 metres above the sea, her cub planted between her front legs. She was quickly the main focus in everyones camera lens! We saw another 2 bears on the next beach, one so fat it was surprising she could move so fast. Then another bear high above the bird-cliffs above us, and so the morning went on. We landed on a little beach at the SE end of the Island and stomped around to warm our feet – and to pose for our landing shots as very few people ever get to Herald Island, the dennng polar bear capital of the Russian Arctic. The beach was also the site where the bodies of 4 members of the Karluk expedition had been found in the 1920’s. They were a reconnaisance party trying to find a route across the sea ice to Wrangel Island, from where their ship the Karluk had been crushed by ice and sunk. Unfortunately they reached Herald Island instead, where it appears they became trapped by open water. A less hospitable place to land would be hard to imagine, with almost impregnable granite cliffs and tors surrounding the whole island. As if the day hadn’t given us enough, we had a call from the bridge immediately after our lunch back on the ship, “Bear and cubs on starboard side!”. Another bear stampede and what a treat! 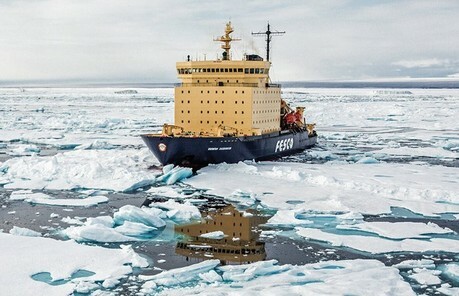 A beautiful polar bear with 2 half-grown cubs walked fearlessly along the ice flow next to the stationary ship for perhaps 200 metres, the icing on the icing on the cake. We headed back to Wrangel and made a late afternoon landing at Dragi Bay, ice floes moving quickly in all directions due to the strong current. We had just enough time to visit a new memorial to the crew of the Karluk, shipwrecked on the island in 1913-14, before the First Mate called us back to the ship due to the unpredictable ice conditions. We met more bears on the way back to ship, as well as whales, bringing the day’s tally to 40 - another stunning day in the high Arctic. Back on board we stowed the zodiacs and set a course back toward Krassin Bay on the south coast of Wrangel Island. Places visited: Anchored at Krassin Bay, Wrangel Island: Last walk on the Island. 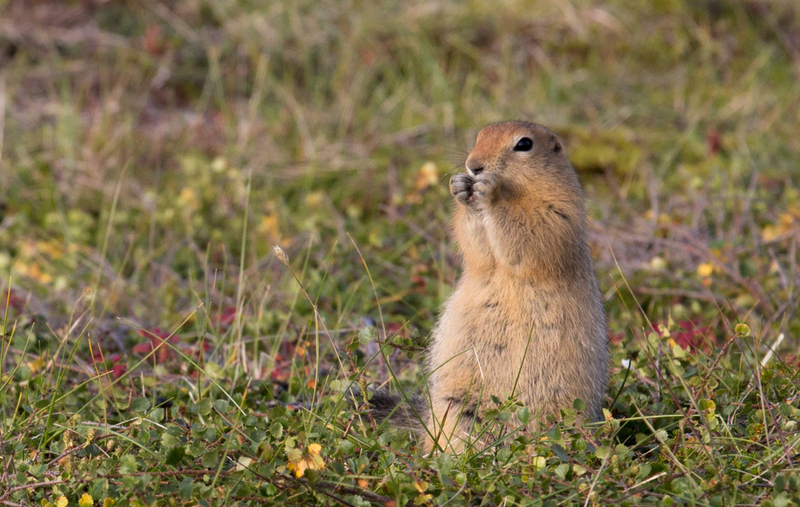 Wildlife highlight: What the ‘overlanders’ saw: arctic fox cubs, lemmings, musk ox, snowy owl. 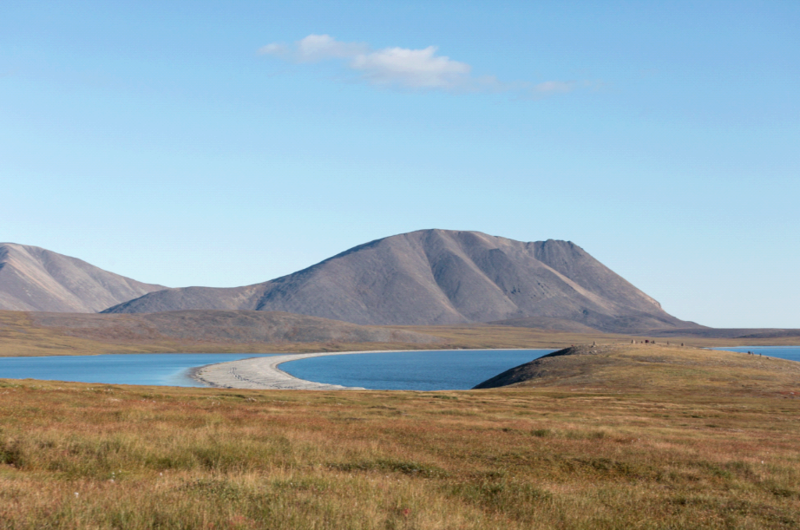 Landscape highlights: Last views of the tundra and mountains of Wrangel. Lectures: Samuel on Polar Bear Biology and Ecology. Katya on The Future of Polar Bears in a Changing World. 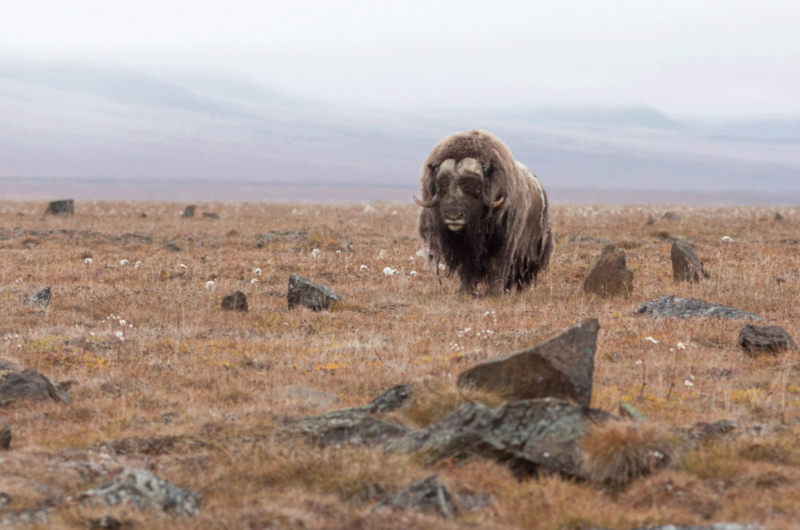 Today was our chance for a last quiet walk on the tundra of Wrangel Island. Many of us simply sat and reflected and tried to take it all in. 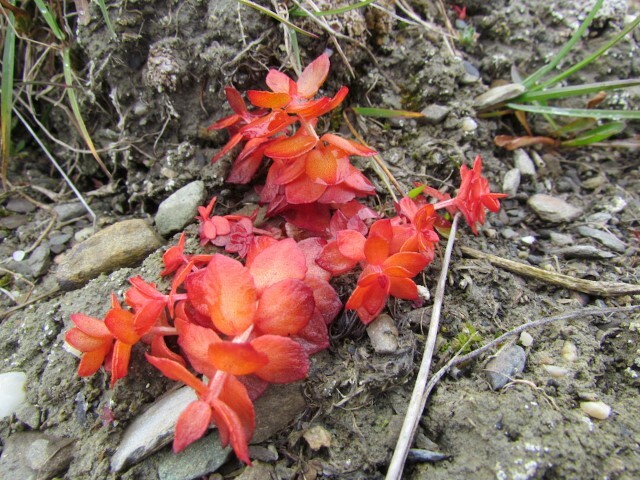 Some saw an Arctic fox near its den above the creek, other snow bunting, plovers and the last of the tundra flowers. We welcomed the enthused ‘overlanders’ back, farewelled the park rangers and by lunch-time had weighed anchor and headed south toward Kolyuchin. Places visited: Wrangel Island to Belyaka Spit at the entrance to Kolyuchin Inlet. Sea conditions: 2-3 metre swells, water 5C. Wildlife highlights: Humpback whales in high numbers. Pacific loons, emperor geese, ground squirrels and brown bear tracks at Belyaka Spit. 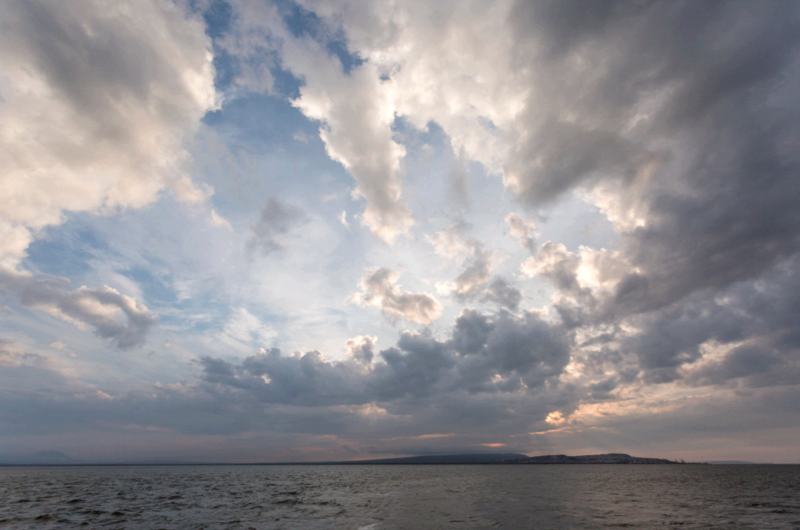 Landscape highlights: Dusk walk in Belyaka wetlands in Kolyuchin Inlet. 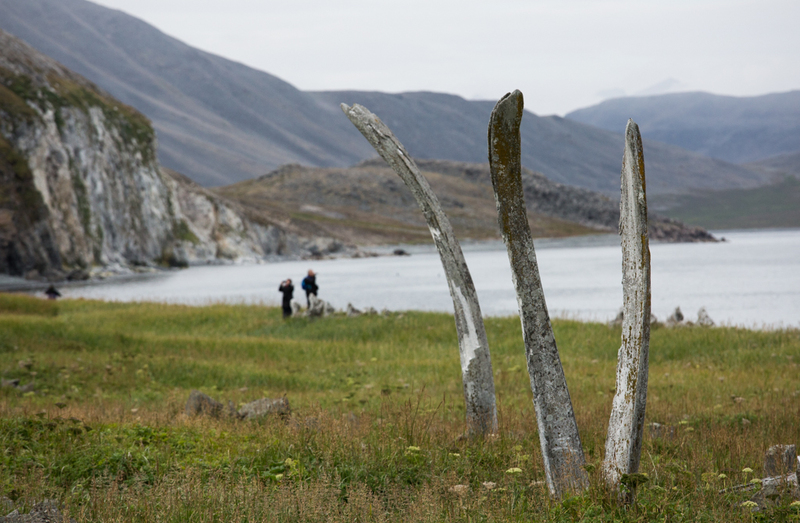 Cultural highlight: Memorial cross, reindeer herders’ graves and ancient yaranga mounds on Belyaka Spit. Lectures : Nikita Ovsyanikov’s documentary ‘Life on the Field of Bones’- about his polar bear research on Wrangel Island. After a full day at sea, we landing at Belyaka Spit for a welcome walk around. Local Chukchi staying there warned us of a family of bears in the area and let us know that reindeer-herders were camped about 5 kilometres inland from us. Belyaka Spit forms the entrance to the massive Kolyuchin Inlet. It was long a conjunction between reindeer herder and marine mammal hunter commununities, whose artefacts, graves and dwelling mounds remain in evidence. We headed out across the tundra in small groups, the ground alternating underfoot between dry sandy ridges (easy travel and populated with the beautifully camouflaged Pacific golden plover) and very wet peat bogs surrounding the numerous ponds. The mournful cry of loons (elsewhere known as divers) drew us toward the open water, where a pair of Pacific loons with chicks were parading up and down the open water, unsure of our approach. Their smart black and white plumage was stunning. Some of us came across human skulls and bones lying out in the tundra, their owners’ former posessions scattered around them – sled runners, a rusty rifle, a broken cup, a reindeer-herder’s prod. Rodney had asked us at the briefing to leave any such articles well alone, explaining that instead of burying their dead deep in the ground (impossible anyway because of the permafrost), human remains were left exposed on the surface of the tundra, open to the big skies and the elements they had known so well in life. Places visited: Third time lucky! Kolyuchin Island Landing. Weather: SSE wind 5-7 knots, 8-12C. Wildlife highlight: Photographing and watching the bird-cliffs at Kolyuchin Island. Between 0530 and 1030hrs the sea was alive with whales - mostly humpbacks with a few bowheads. In every direction they spouted, surfaced and breached, a massive feeding frenzy in these shallow and productive seas. We arrived back at Kolyuchin Island for one last try at getting ashore. Once Samuel, Rodney & Katya had checked out the abandoned weather station for resident polar bears we finally managed, on this our third visit, to land on the little rocky beach at Kolyuchin Island. Staff in waders held the zodiacs steady in the surf while passengers piled off and on. A second option of cruising the base of the cliffs by zodiac without landing was also popular. Those on shore clambered up a grassy slope to vantage points overlooking the bird cliffs, every ledge crammed with the adults and chicks of gulls, puffins, kittiwakes, guillimots and pelagic cormorants – a bird-watcher’s paradise. 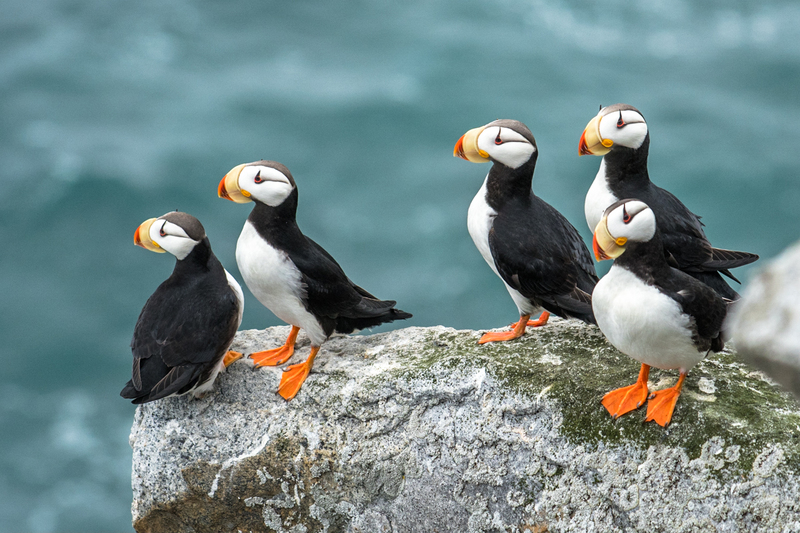 The tufted and crested puffins were particularly charismatic with their bright orange feet and beaks; clown-like faces and awkward style of flight, coming in to land on the cliffs with legs and wings splayed wide open, sometimes with fish hanging rakishly from their beaks to feed their young. A number of kittiwake chick carcases floated in the sea beneath the colony, pecked at tentatively by fledgeling glaucous gulls still learning the ropes. Places visited: Cape Dezhnev & Naukan Village. Sea conditions: 1-2m swell, water 9-10C. Wildlife highlight: Bear tracks and bowhead whale baleen plates on the beach at Cape Dezhnev. Ground squirrels at Naukan. Cultural feature: The abandoned village of Naukan. Lectures: Katya on Cetaceans of Chukotka. Samuel on the legacy of early naturalist George Steller. Katya gave us a quick briefing straight after breakfast on the history of Naukan Village and Cape Dezhnev: Naukan was an Eskimo (as they call themselves locally) village of marine mammal subsistence hunters for thousands of years. Its location on a relatively protected terrace overooking the narrowest point of the Bering Strait made it perfect for hunting. The village supported about 400 people living in 83 dwellings, a mixture of yarangas (traditional round houses covered in skins), wooden huts and dugouts. That all changed in 1958 with the Cold War, when Soviet officials forcibly relocated the residents to other villages and towns. The border guard post built only a stone’s throw from the empty village was in its turn abandoned after the demise of the USSR and is now crumbling into the sea. We landed by zodiac and wandered slowly through the ruins, pondering the lives and commmunities whose lives echoed there still; an old pair of boots growing lichen; a copper kettle; a steel bed frame; whale bones. Wildlife highlight: The ship surrounded by fulmars, short-tailed shearwaters and kittiwakes. Lectures: Rodney on the (formidable) logistics behind a Heritage Expedition. Chris on Biodiversity and Conservation in Russia and the R.F.E. A leisurely day at sea, with breakfast a luxurious 0830hrs. Samuel presented passengers with a photographic and musical slide show representative of the fortnight we’ve had together travelling across the ‘Top of the World’, complete with bears and musk oxen, grey and humpback whales, puffins and guillemots, ground squirrels and lemmings, tundra plants, mountains and plains, sea-scapes and ice-scapes, zodiacs and passengers, hot pools and cold zodiac trips. This was followed up an hour later with a brilliant hemispheric rainbow directly behind the ship and the finest sunset of the fortnight over the bow, embellished perfectly by a surfacing minke whale and a low-flying flock of short-tailed shearwaters – a fitting end to an incredible fortnight. Disembarked at Anadyr for our respective homeward or onward journeys, reluctantly farewelling each other and our beautiful ‘time out of mind’ in the Russian Far East.
" I had a great trip, seeing Horned and Tufted Puffins and 3 species of Auklets which I'd really hoped to see. We had an amazing experience with a Gray Whale and saw many Polar Bears. The staff worked really hard to make our experience a special one and the passengers were friendly and interesting. I also enjoyed the lectures getting to know some Russian people and seeing a little of the very different life some of them live. "